This was a question I had no answer to. I realized I didn’t know what it meant to meditate. Images of sitting cross-legged on a mountaintop while chanting words I didn’t understand flashed across my mind. They didn’t seem particularly helpful or enticing. After all, it’s not as tangible as going to the gym or reading a chapter in a book. It’s not like we ever watch others meditate either; it’s a personal activity. Is it just deep thought? And how do you know if you’re there? There were enough signs from the universe to realize there was something powerful to gain from meditation practice. So gradually, I began trying it out for myself. I visited yogis, attended a meditation workshop, went to meditation classes, and listened to recordings. I learned a ton and developed what I now consider an extremely useful skill. But most importantly, I realized meditation didn’t need to be costly, complicated, or time-consuming to reap the benefits. As with many things, even a little bit can work wonders – especially in the beginning. I want to make this as easy as possible so you can get started today if you choose. Much like training your body in the gym, I found that meditation is about training the mind (rather than just filling it with information). It’s kinda like exercising your muscles, except these “muscles” are awareness, calm, and your brain. But I Don’t Have Time To Meditate! It’s a tongue-in-cheek jab at our 21st century habit of burying yourself so deep in work and I’m busy‘s that the only way out is to lock yourself in a meditation chamber for three hours before you finally let go and realize you’ve been going too fast. It works better than all the time-out’s your parents threw at you though…and if you’re a parent, perhaps switching time-out for a guided-meditation might be a better use of your kid’s time than stewing in rebellious rage. Kids, work, family, projects, school, caring for loved ones, and saving the galaxy after dark… I get it, your life is busy. You might feel anxious, stressed, rushed, or generally negative about yourself, and it might feel like time is never on your side. With so much going on, you feel like you can’t afford to spend any on meditation. Trust me on this – meditation will help you reclaim your time. One of the best benefits of meditation is learning how to slow down and return to the present moment. Through a shift in perception, time will come back on your side. Suddenly you notice that for everything that is important, there is enough time. With so many different kinds of meditation, it’s easy to get lost in the details of postures, breathing, mantras, and what to focus on. Worrying about details is a sure way to miss the whole point before you even begin. Like I said, I want you to be able to experience the greatest benefit without hassle or worry of whether or not you’re doing it right. Let’s keep it simple and get started today! Step 1: Set aside at least 10 minutes. Step 2: Find a comfortable place to sit or lie down. Here are three to get you started. Short on time? This is ten minutes with a female guide. Feeling hurt, angry, or hopeless today? This one will help restore some positive energy with a female guide. Or perhaps you like the dulcet voices of Australian men like me? (I can’t help it. )UPDATE: I recently began using the Headspace App and it’s brilliant. The only downside is that it’s so good that I usually wake up three hours later. But that’s my own fault for defiantly lying down instead of sitting like they told me to. Step 4: Close your eyes, drape a towel or shirt over your face, take a moment to get comfortable and relax the weight of your body. Step 5: Hit play and follow along. If this is your first time, you’ll be constantly worried about whether you’re doing it right or not. This is normal. Your mind may wander (okay fine, it will.) and start thinking about dinner and forget what the guide is saying. You might fidget, suddenly finding it impossible to settle into a comfortable position. You might even fall asleep and start snoring. 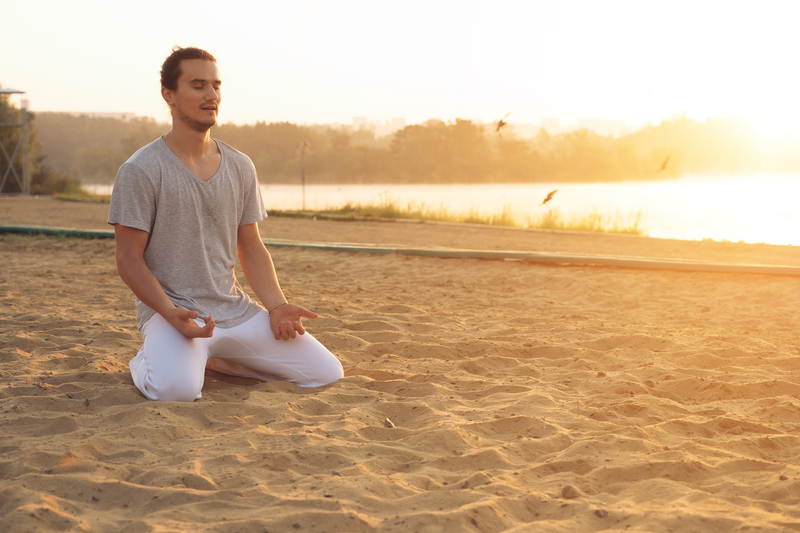 Good news – You’re meditating!! These are all okay and totally normal. Just take notice and get back to following the voice. Your ability to focus and relax will improve every time you meditate. And if you do fall asleep, it’s usually just a sign that you’re tired and finally gave yourself permission to relax. Do you live a particularly stressful life? Challenge yourself to sit for at least 5-10min every single day for a whole week. Personally, I usually use it when I’m feeling a lot of stress or anxiety and it helps. Every once in a while I will go through a stretch of time where I use it daily, being proactive rather than reactive. I also often use it when I go to bed to enhance the depth of my sleep. And then I wake up feeling like I slept for a thousand years. I’ve made it easy – just start.